As of this writing New York City is on track to break the record for the lowest number of pedestrians killed by motorists in a year. The current low mark of 132 139 deaths was set in 2014, the first year of Mayor de Blasio’s Vision Zero initiative. To live up to his pledge to take Vision Zero “a lot farther,” Mayor de Blasio will have to use every tool at his disposal. Assuming the official numbers bear it out, the de Blasio administration deserves credit for this milestone. Lowering the city’s default speed limit, adopting laws to hold negligent drivers accountable for causing harm, and deploying the maximum number of speed enforcement cameras permitted by Albany have almost certainly helped reduce the death toll. Another record low number of traffic deaths would surely grab headlines. However, it looks like injuries will remain mostly static from 2014 to 2015. Injury figures are not as prone to random variation and are a more reliable safety indicator than fatalities. To get those numbers down, and to further mitigate needless loss of life, the de Blasio administration will have to fully commit to prioritizing walking, biking, and transit over driving. Streets that are safer for cyclists tend to be safer for everyone, yet this year DOT backed away from de Blasio’s commitment for 6 percent bicycle mode share by 2020. DOT has shied away from adding bike lanes to streets that are crucial to creating a viable bike network, even when City Council members want them. The agency’s timidity was highlighted this year by the grassroots “Department of Transformation,” which conducts low-cost street reclamations where DOT has failed to act. Police Commissioner Bill Bratton made clear his attitude toward livable streets when he suggested that the Times Square plazas be ripped out — a public relations disaster de Blasio declined to contain. Given Bratton’s apparent distaste for people-oriented streets, it’s little wonder NYPD has applied the Right of Way Law only a few dozen times since it took effect in 2014. NYPD still investigates a fraction of all traffic crashes, and hit-and-run drivers are almost never brought to justice. In a year when motorists killed at least 15 people on sidewalks and in buildings, NYPD precincts advised seniors to wear bright clothing and focused enforcement on people walking and riding bikes. There are elements of Vision Zero that are beyond the mayor’s control. He can’t force district attorneys to prosecute driver recklessness. He can lobby Albany for control over city traffic cameras, but he can’t keep know-nothing state legislators from wasting precious time and energy by blaming victims of traffic violence. But if he wanted, de Blasio could order DOT to amend city traffic rules that police and prosecutors say are an obstacle to enforcing the Right of Way Law. He could make sure DOT doesn’t allow community boards to derail safety projects. He could get all cars out of city parks. He could work with the City Council to fund more street improvements. “There are a lot of things that have been accepted as the status quo that we should not accept,” the mayor said in November. “We have to jolt that reality, we have to change that to the core.” To make that happen, de Blasio will have to use every tool at his disposal. Here is our accounting of New York City pedestrians and cyclists known to have lost their lives to motorists in 2015. In the comments, please share remembrances of those named here, and the names and stories of victims we missed. Given all the talk about record low levels of violent crime in a year when police essentially walked off the job for part of the year, maybe Commissioner Bratton should assign more beat cops to the Collision Investigation Squad. Every precinct should have trained, embedded CIS personnel who investigate hit and runs and injury collisions that occur in their precinct. There should be thousands of these investigations every year, rather than a few dozen. Thank you for helping us remember the neighbors we’ve lost. Would love to see this broken down by age, race/ethnicity, income and borough. Yeah. Instead we get bleating from current and former NYPD leaders brass about how ending stop and frisk will result in more deaths, how they need more and more to fight terrorism and surveillance, etc. The NYPD work slowdown after the Eric Garner verdict made it damned clear – we have too many police for the way they currently work. I’m all for preserving their jobs as long as they can focus on stuff that actually matters. Like these deaths. And how about putting some manpower to track down more of the 30,000 (!!!) annual hit-and-runs? And yes, every precinct should have an embedded CIS squad. Great idea. I’m all for preserving the jobs of the police who aren’t violent murderous thugs. But we’ve got to start getting some accountability. There’s clearly a crime spree going on within NYPD and someone needs to start breaking up the gangs operating under cover of the blue uniforms. Rest in peace to all these victims. Sheniqua Silva’s sidewalk death in the Bronx haunts me still. I know this is a memorial to the pedestrians and cyclists who died, but in thinking about vision zero and the uneven progress so far, I also tend to remember Bob Simon dying on the West Side Highway last winter. There’s so much at stake and we’re all at risk, whether people admit it or not. More Vision Zero Action Ahead in 2015, Says De Blasio, But Where’s Bratton? 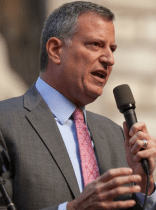 De Blasio announced no increases for the city's street redesign budget, nor any other changes to traffic safety policy levers that he directly controls.